Satria Fu guise of LED lights is a mototr spare parts designed for the type of motor Satria FU 150cc. 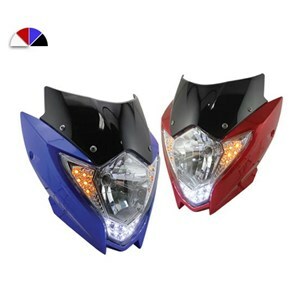 This product is installed on the front lights as accessories or spare parts, visor is equipped with LED light feature that will add elegance and sporty impression on motorcycles. Shock Breaker is one of the motorcycle parts designed to dampen the buffeting caused by kinetic energy. Parts once this vital function is to provide comfort for rider and passenger. Shock Breaker consists of a tube containing the oil. Inside the tube there is a valve that serves to regulate the flow of oil. The level of security and comfort in driving course should take precedence before you start driving. Safety and security are the main factors that really needs to be maintained when you drive. Therefore you need a motorcycle spare parts with high berkualtas original product. 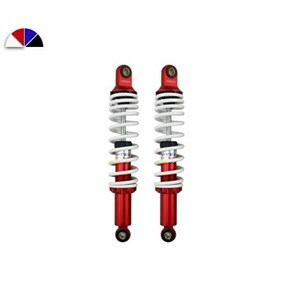 As Shock Breaker exact original quality is guaranteed, with products that have been tested before released definite quality guarantee you will get a product that fulfilled both the safety and comfort.